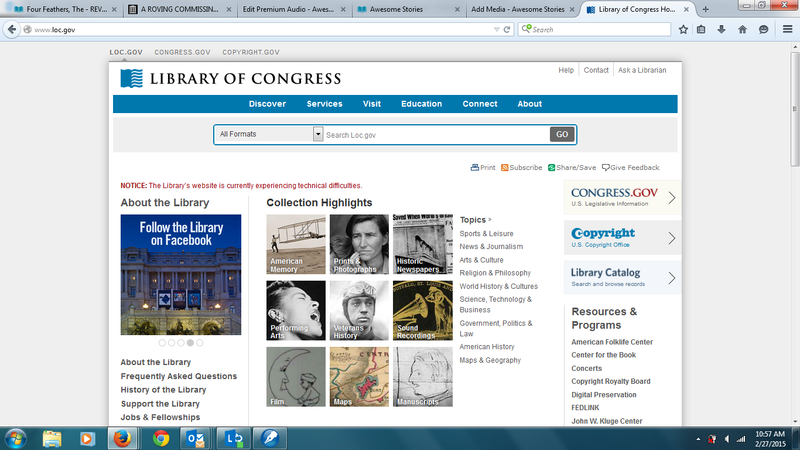 The Library of Congress has a vast archive of pictures, documents, audio/video clips, books, objects and other primary and secondary sources. These items are not just about America. Among its other assets, for example, the Library has a copy of the Magna Carta. It is not easy to search these vast and amazing archives (and sometimes the Library experiences "technical difficulties"). 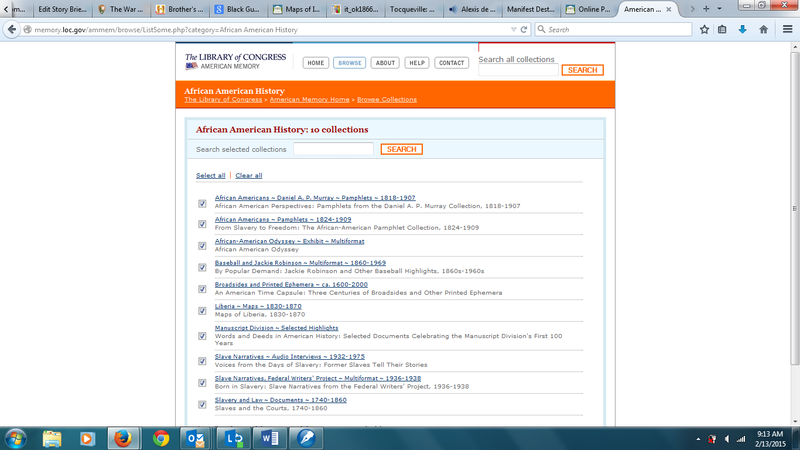 This is a brief tutorial on how to search, find and retrieve what you need to use from the Library's awesome treasures. 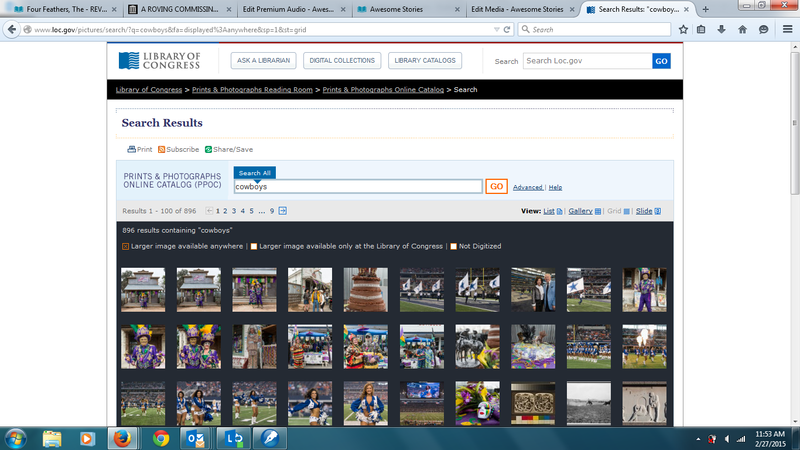 When you visit the Library's main search page, you will see a search bar at the very top of the page. You can begin your search by visiting one of the Library's Collections. Let's select "Prints and Photographs." The link takes us to the search page for Prints and Photographs (which includes prints and photographs from all over the world). You will immediately see a search bar. Type in your search topic. 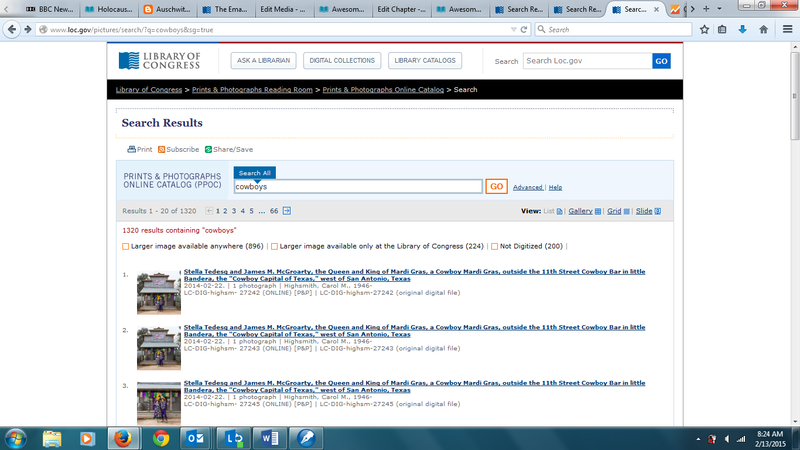 Here's a tip about searching at the Library of Congress. Don’t think this is like Google, where you can type in lots of words or phrases (including misspellings) and then arrive at predictive results. The search process, at government archives, does not respond to expansive search terms and misspellings, and it does not give predictive results. It responds to simple, correctly spelled requests. 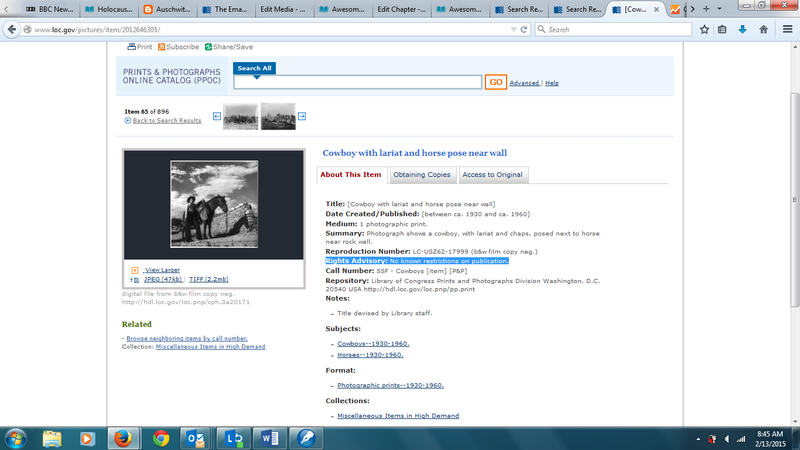 Suppose we're researching the "Old West" and want to find some resources about cowboys. Type cowboys into the search bar. After you hit the red “GO” button, you arrive at your first stop in the search process. This is how it looks when you first arrive. Our search term is pretty broad, and “Cowboys” could apply to the Dallas Cowboys (plus other non-related "Old West" cowboy topics). Since we don’t want to miss any potential treasures, however, it’s good to see an overview. Gallery leads to bigger thumbnails with more pages to go through; grid leads to smaller thumbnails with fewer pages to go through. Let’s check-out the differences. 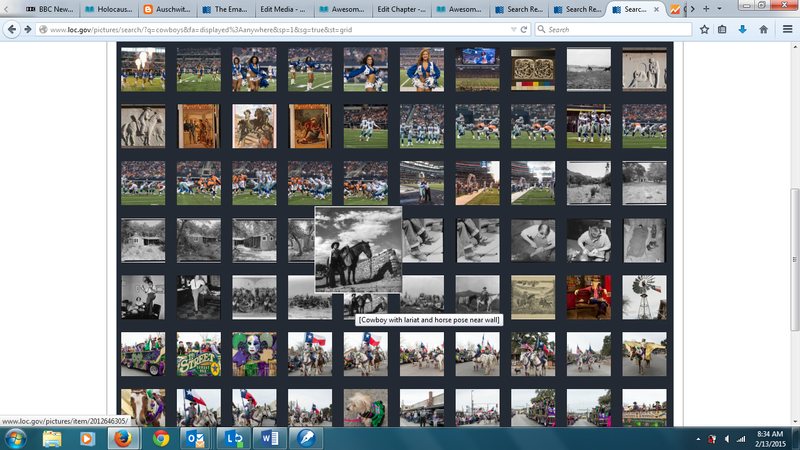 The grid displays many pictures. Some apply; some don’t apply. Let’s pick one which applies to our search, then hover our mouse over it. Mouse-hovering leads to a description of the picture and a bigger version of it. This is a picture which might be good for our story. Let’s check it out further (and determine whether we can freely use it). Left-click on the picture. Here’s what you see next. 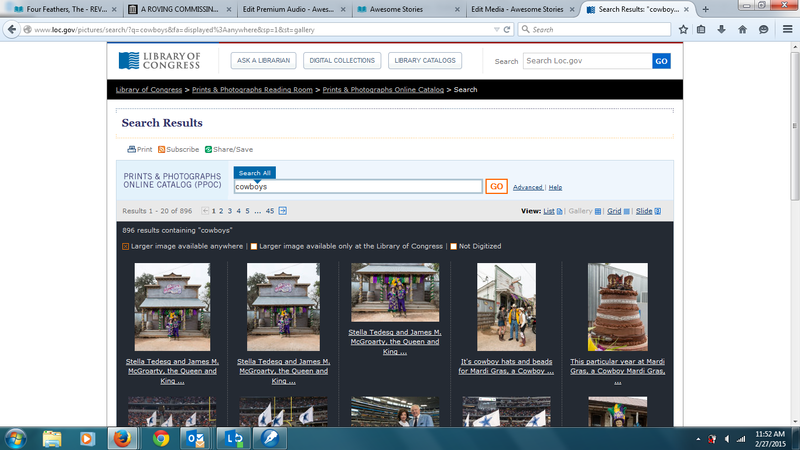 Every single search through the Prints and Photographs collection at the Library of Congress has a page like this one. It provides all the necessary information about the picture and tells us whether it is copyrighted. Keep in mind that something which was once copyrighted may no-longer be copyrighted. For example, if too much time has passed, the copyright may no longer be in force. Look for the “Rights Advisory,” on the right side of the picture. (It’s the sixth item from the top.) It will tell you whether there are any use restrictions. Most of the prints, pictures, documents, etc., at the Library of Congress (and at the U.S. National Archives) are copyright-free with “no known restrictions on publication.” Those items are in the “Public Domain,” making them available for anyone to use in any way one wants to use them. We know the cowby picture is not protected by copyright, so we can freely use it, but we still have to give credit for it. Everything we need, to give proper credit, is also provided in this section (pictured above). We can tell when it was created or published—here sometime between 1930 and 1960. We know the Library of Congress has a Reproduction Number for it: LC-USZ62-17999. We also have a title and a summary regarding this picture. We can either use or own words or the Library-staff words. If we use the Library-staff words, we have to put them in quotes. 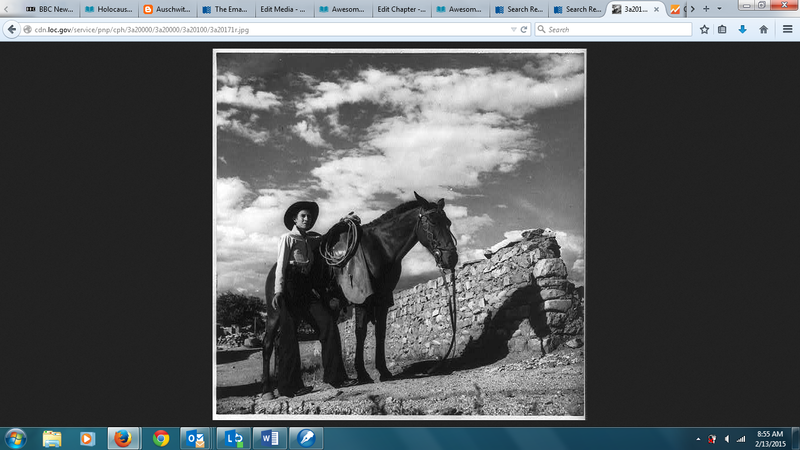 Now we want to actually take the picture for our own story which we’re creating in the AwesomeStories Builder. Underneath the thumbnail version of the picture, you will see three options. Left-click on the "JPEG" option. This is what you see. Copy the URL (as it’s highlighted in this screen shot), then paste that URL into the story you are creating with the AwesomeStories Builder. It will "magically" appear in the media stream. 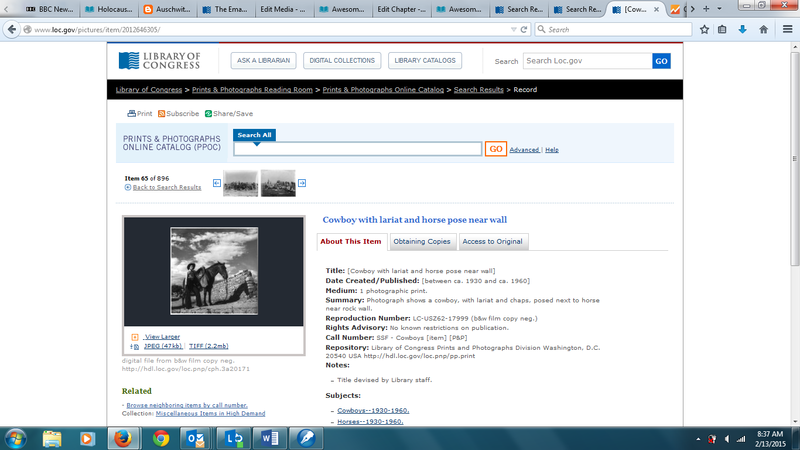 And … that’s how you search-and-find primary and secondary sources at the Library of Congress's picture collection. The process also works the same for other collections at the Library. 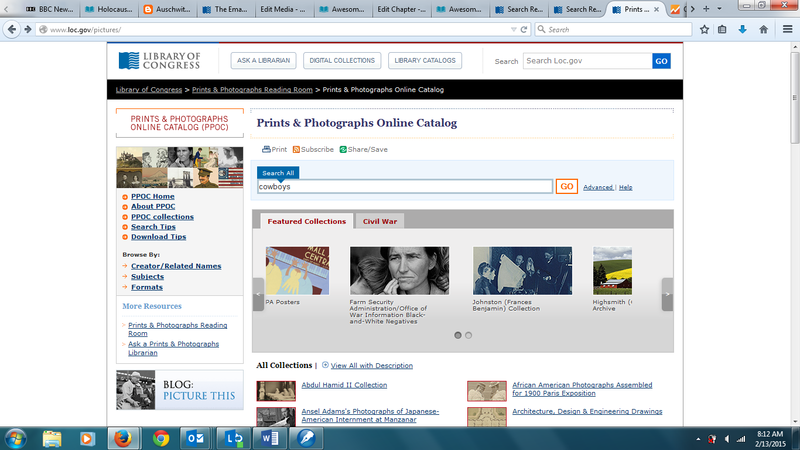 If you don’t find what you need in the Prints and Photographs Collection, you can search the American Memory Collection at the Library of Congress. ("American Memory" means all items are American-based, not worldwide-based.) This is how you get there, and this is what you see when you arrive. 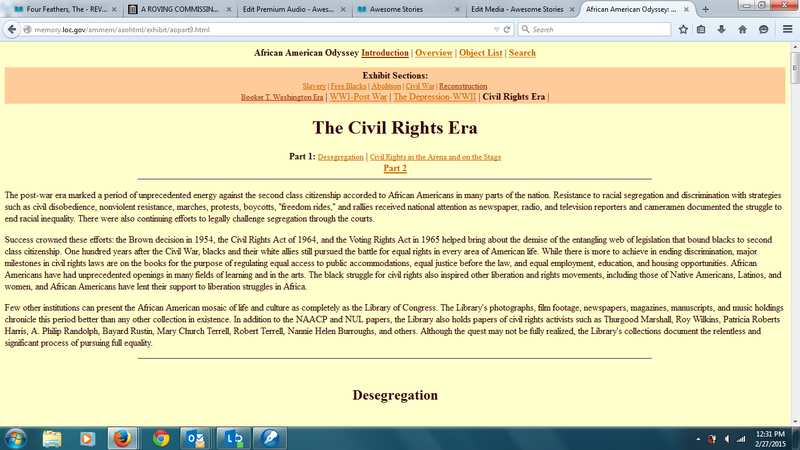 If our topic is African-American History, click on that selection. Here’s where you go. Whenever the Library of Congress has created something special about a topic, gathering all the best materials in one place for us to view, the Library’s staff refers to those items as an “Exhibit.” LoC exhibits are wonderful places to search because the LoC team has jump-started your search for great materials. In this list of topics, we see there’s an “Exhibit” positioned third-from-the-top. Click on it. 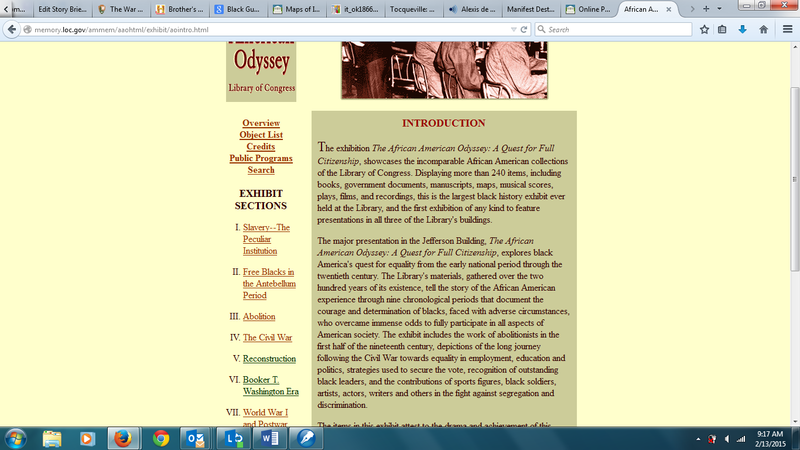 When we arrive, we have six major categories to explore at this “Exhibit.” Let’s pick the first one: “African-American Odyssey: A Quest for Full Citizenship.” When you click on it, you see nine (IX) different topics in the "Exhibit Sections." Let’s select the Civil Rights choice. It's number IX at the bottom of the actual American Memory page. There are lots of interesting subjects to explore in this Exhibit. 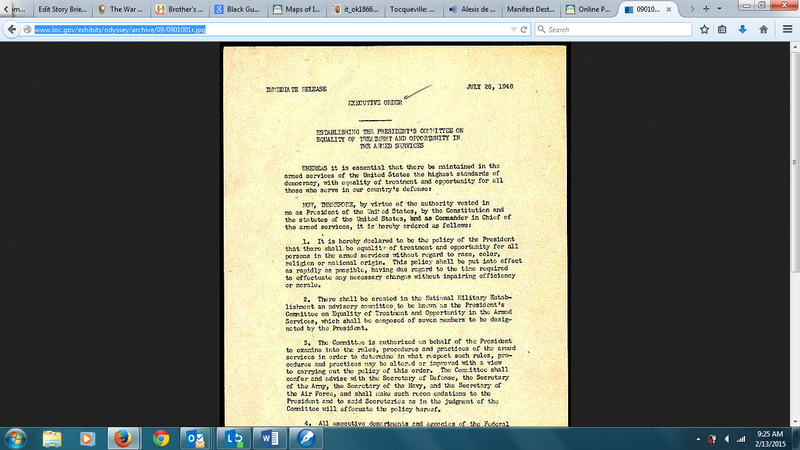 Suppose our research question is: "When did the United States government integrate the American military?" We quickly find our answer. 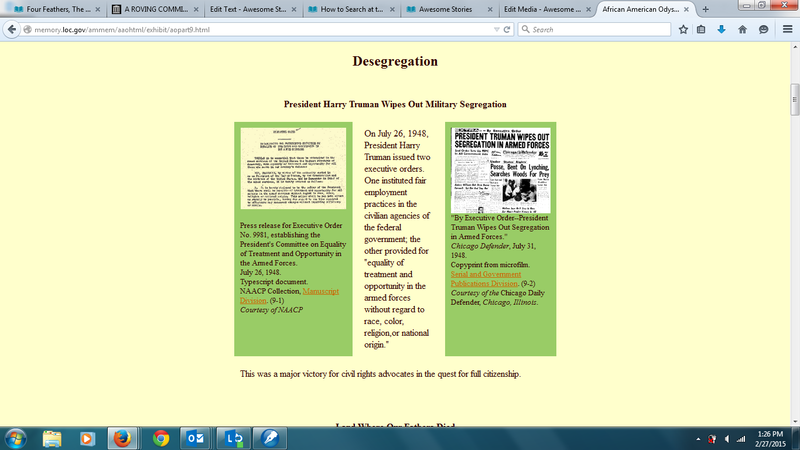 The President—Harry Truman, at the time—had a press release issued about his Executive Order to desegregate the U.S. military. From that press release, newspapers around the country published the news. If we want a great primary source on the news, we go to the Press Release. When we left-click on the image, we get the document. You can quote from it, using the actual words from the first notice that was issued by the President announcing integration of America's military. And THAT’S how you search through the vast digital archives at the Library of Congress (where you can find all sorts of primary-and-secondary sources to build your story with the AwesomeStories Builder. Have fun exploring (and building)! 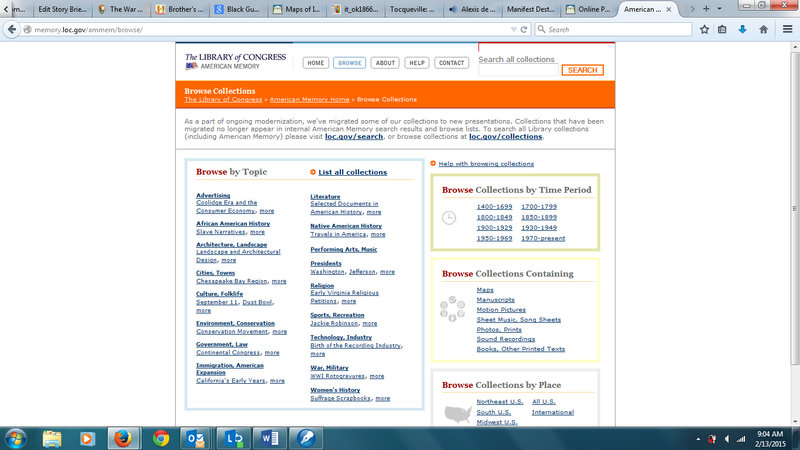 "How to Search at the Library of Congress" tutorial by Carole Bos, creator of Awesome Stories.